Star Realms is a spaceship combat deck-building game by Magic Hall of Famers Darwin Kastle and Rob Dougherty (Ascension Co-founder). 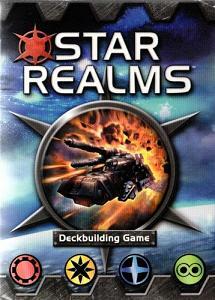 Star Realms is a fast paced deck-building card game of outer space combat. It combines the fun of a deck-building game with the interactivity of Trading Card Game style combat. As you play, you make use of Trade to acquire new Ships and Bases from the cards being turned face up in the Trade Row from the Trade Deck. You use the Ships and Bases you acquire to either generate more Trade or to generate Combat to attack your opponent and their bases. When you reduce your opponent’s score (called Authority) to zero, you win! With multiple decks of Star Realms, one for each two people, you can play scenarios that allow for up to six players.